Fremont sewer repair contractor gives puppy to sewer clog customer who lost her son. She and her husband can't believe there are still good people out there. Fremont sewer repair contractors at Evenflow plumbing care a great deal about the local community they work in, reported by Jennifer Kho, At this time of year, Fremont resident Marlene Micco is always unhappy. Her son was killed in a car crash just before Thanksgiving in 1996, three weeks after her father died, and the holidays are especially difficult. “People say, Aren’t you over it yet?’ and I say, “It is my son. I’m never going to get over the pain of losing my son it never gets better it just gets different.” And this year, it seemed that things would be even worse. Their sewer clogged and needed serious repairs. 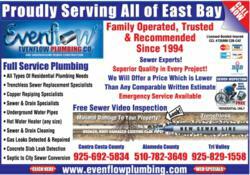 So Micco called Evenflow Plumbing and the owner, Gary Dimodana, came to fix the sewer. While he was making space in the pipes, he came up with an idea to help fill the void in Micco’s life. “ I don’t know her from beans, but she was just super sad about her son and I didn’t want her to be sad,” Dimodana said. “She just seemed like she needed something, like she was missing something.” He decided that Micco needed a puppy. “I got my first puppy at 8 and I don’t know it did - it made me happy,” said Dimodana, who owns two dogs himself. “The puppy will love you no matter what, it’s unconditional and it’s just a great feeling.” He had a friend who had a litter of pomeranians, and he asked Micco if she would like one. Muffin, as the Micco’s grandchildren named her, is a foot long 13 week old papillon puppy, she is black and white , weighs 5 pounds and skitters all over the floor playing enthusiastically with her toys. Frank Micco plays with her fighting over the, “flower snake,” the floral printed oven mit. “She takes up a lot of my time, but she’s OK,” he says, teasingly. “She follows me around like a puppy, and if you leave her, she just sits and waits for you. The only thing wrong with her is she’s too small to chase cats away from my bird feeders, I’ll train her though.” “No, not my Muffin!” Marlene Micco says, laughing and pulling muffin onto her lap. “You’re worth a million to me.” She put Muffin down to bounce around the kitchen floor again.